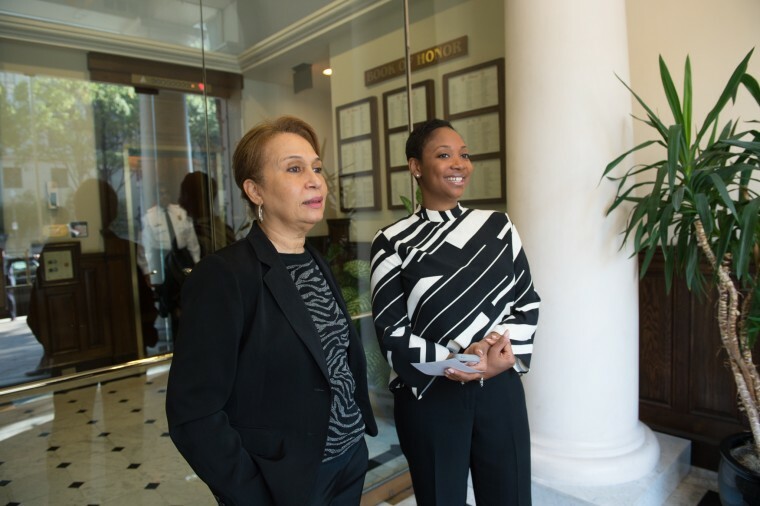 LaDavia Drane, (right) Hillary Clinton's Director of African American outreach, stands with Alexis Herman (left), former Secretary of Labor under President Bill Clinton. The political world raised a collective, knowing eyebrow when Hillary Rodham Clinton announced that LaDavia Drane, the former executive director of the Congressional Black Caucus, was signing on to be Clinton’s director of African-American outreach. The announcement came this past May and since then Drane clearly has been making good on that title. Recent polls show that Clinton, one of three Democratic presidential nominees, has the support of 69% of South Carolina’s most likely voters. And, those likely voters are also most likely black. Clinton’s empathy points rose when she met with factions of the nation’s hugely diverse communities of color, including Chicago mothers of children killed by gun violence in Chicago and leaders of the Black Lives Matter movement in Washington D.C.
“Policy matters,” says Drane, 32. “I think that we’re living history. This is the first presidential campaign coming off of what has been an extraordinary African-American president. The African-American electorate is a sophisticated electorate." Drane demurely says she cannot and will not take sole credit for Clinton’s African-American connections. She is, after all, a former Secretary of State and senator who is married to a former president. Yet, Drane was still brought on board, and according to campaign insiders, offers valuable insight for their cause. But how exactly did Drane get here? Diversity work has comprised the bulk of Drane’s life resume, from her time as a top student at a Cleveland Catholic high school to her work on student government as secretary of diverse affairs at Miami University in Ohio to her decision to help with then Senator Barack Obama’s campaign to now. I talk to any and everybody that I can get my hands on. There are certain people you want to touch and engage early. In college she created programs to bring a more diverse student body to Miami University. After graduation, she practiced law with one of Cleveland’s largest firms and then eventually went on to work with the Congressional Black Caucus to push for assurances that the needs of people of color were met by the federal government. She took a turn in DC government and also with the Grocery Manufacturers Association, where she lobbied before Congress on nutrition and obesity issues. It’s no secret that the black and Latino vote is a crucial segment of the voting population (as is the white vote, which Republican nominees are banking on.) In fact, for the 2012 election, African-American voters were overwhelmingly responsible for Obama's win in several key states. Anyone who can both increase black voter turnout and bring home the black vote is a boon to the campaign. But not many can, because not many understand the tremendous diversity of class, socioeconomic status, education, religion and political leanings of a not-so-ideologically-monolithic group of people of color — and especially black people. It’s not an easy task. Clinton’s 2008 campaign largely failed to engage black voters and as a result Clinton added Marlon Marshall as her director of states and political engagement and the campaign has hired an African-American media firm. Drane fits nicely into this structural rubric, says Congresswoman Marcia Fudge (D-OH), who worked with Drane even before she became the executive director of the Congressional Black Caucus. Fudge also added that many across the country support Drane, trust her judgment and are already lining up to assist. (“We’re going to help her,” says Fudge.) Drane’s tenacity has apparently won her many fans. She’s a new homeowner in the city of Washington DC. She’s the proud daughter of a Marine. And she still makes time for her sorority sisters. In fact, she was the last person in her pledge class, when she became a member Delta Sigma Theta Sorority Incorporated in 2002. For the uninitiated, that location – being last in line - is a really big deal. It means that you are strong, determined and quite dependable. Also telling is that her line name is Ecclesiastes. Drane won’t say exactly why her line name was taken from the Bible, but the nickname speaks to something of her character. Ecclesiastes is many things, but one overarching theme of the book is that wisdom is better than folly, but wisdom itself must occasionally be challenged. The book offers a blunt and honest look at the human condition. Sounds like Drane, says her line sister Carollette Phillips, 33, a Detroit native who teaches choreography and oversees the non-profit division of her family’s LSO Dance Academy. Phillips scoffs at naysayers who think Drane is too “high post” aka upper class, to work with all facets of the black community. Drane’s dad is a Marine, so she can relate to military. And in her family, she was the first to attain the kind of six-figure salary afforded to many big-city lawyers. Drane’s not worried about her ability to communicate with “Cousin Pookie,” as some pundits have questioned. She’s also not concerned with the rising number of outspoken whites who question the validity of courting black voters. Adrienne Samuels Gibbs is an award-winning journalist whose work has appeared in The Boston Globe, The Miami Herald, Takepart.com, Ebony magazine and The Chicago Sun-Times. Follow her @adriennewrites.